Helen McCrory as Medea. Photo Credit: Richard Hubert Smith. 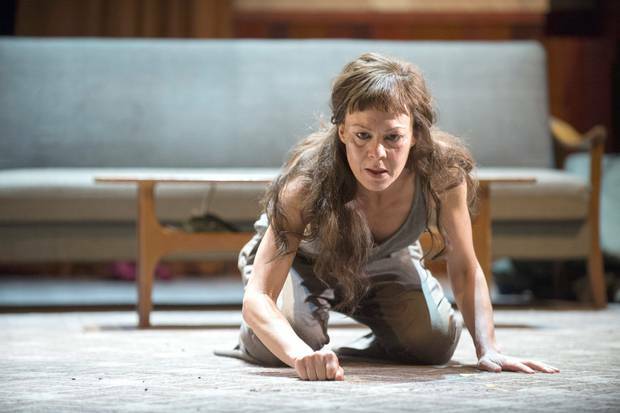 Helen McCrory brilliantly portrays Medea’s tight spiral into revenge. Out of time, out of options, she spends much of the play pacing like a caged tiger through the dilapidated basement that is her domain. The contrast between the dystopian grunge of Medea’s home and the bright, clean wedding hall above emphasizes her position. McCrory skillfully modulates between grief, anger, coldness, and self-deprecating humor, and Medea’s final tortured decision to kill her own children is heartbreakingly convincing. The chorus of Corinthian women, dressed as bridesmaids for Jason’s wedding to Kreusa, lurk passively on the fringes of the stage. They offer Medea their silence, but keep their distance. The contrast between their usual tense passivity and the choral odes, distinguished by marionette-like, spasmodic dancing (choreographed by Lucy Guerin), is somewhat jarring. Will Gregory and Alison Goldfrapp’s music is marvelously unsettling, but slightly overshadows the already shadowy chorus. Performances are strong across the board: Michaela Coel as the Nurse maintains a narrator-like semi-detachment throughout the play, and Martin Turner’s Kreon is a wonderfully smooth politician. The one character I have difficulty with is Jason (Danny Sapani). Sapani handles Jason’s grief over his children brilliantly, but is a tad too upright in his interactions with Medea. For a man described as “a demon, a he-devil,” Medea’s husband is remarkably calm and reasonable, lacking the caddishness that adds insult to Medea’s injury. Perhaps the most surprising element of the production is the decision to cast a silent Kreusa (Clemmie Sveaas) and to show both her wedding and her death. While the sight of a joyful wedding party upstairs visually emphasizes Medea’s exclusion and isolation, showing Kreusa convulsing in the tangles of a poisoned cloak is, I believe, a misstep. A visual image of her death detracts from the wonderfully vivid messenger speech that describes it (here delivered by Toby Wharton). Glutton for punishment? I would gladly be punished with another look at this production. You should check out the Tadashi Suzuki’s production of Electra. Greek tragedy doesn’t get much better than when it’s done by Suzuki. I posted a clip below. Although the play is in Japanese, Suzuki’s principles on performance and direction are based on grounding theater in the traditional roots of antiquity in terms of how a play is presented and received by an audience. He’s all about bringing it back. If you can scrounge through resources at your school’s library, I’d bet you could find a copy and it’s definitely worth checking out. Thank you, Toney! I’ve seen bits and pieces of his Tale of Lear, but I hadn’t realized he’d done Greek tragedy as well. I’m going to have to hunt this down—his approach to staging is just perfect for choruses. What he does in that clip alone, with the chorus in wheelchairs, is fantastic.